With only six weeks to go Christmas has well and truly started. What a delight to once again browse through heaps of leaflets with free ideas for decorations and gifts! I don't know about you, but I'm determined to spend more money than ever this Christmas. What better way to show your friends and family you love them? Of course, Christmas is also the time of year when we think about all the miserable people. Luckily, we're also getting plenty of direct marketing communications about how we can help them. That way we don't have to worry about which charities we do and don't want to support, which means we'll have more time for decorating and shopping! 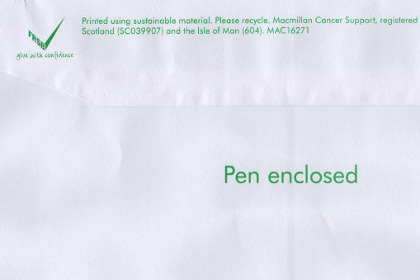 That's right, a Free Pen from Macmillan Cancer Support! However… much to my dismay the pen was missing. All that was enclosed was a letter from Bevery Hurst, who asked me for £10 and assured me that she doesn't normally write letters like this but that this Christmas she needs my urgent help . It's actually the seventh urgent appeal I've received from Beverly but that's beside the point. There's a real concern here: Macmillan has run out of pens! 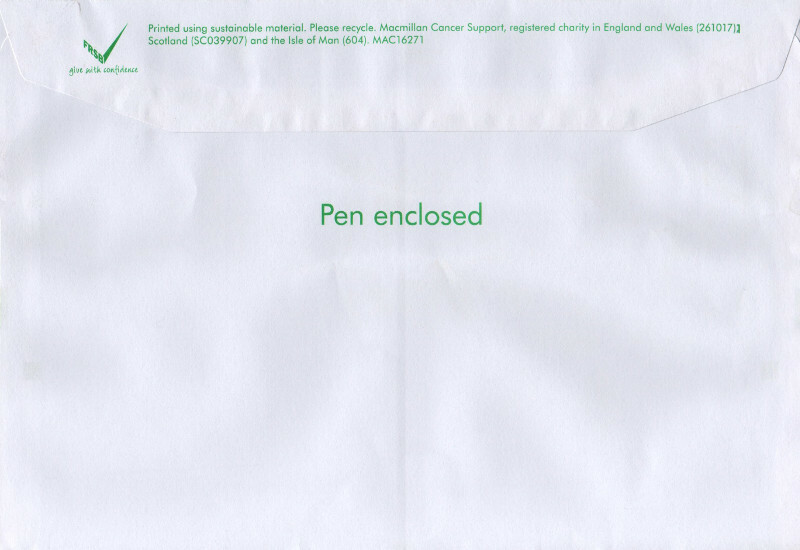 I'm somewhat of a direct marketing expert and I know for a fact that Macmillan's free pens really help enhance its message and the emotional engagement with its cause. Some evil tongues might cry that the free pens are enclosed only to make you feel guilty if you don't give something back in return, but I can assure you that's not the case. If you don't believe me, ask Beverly. What we're witnessing, then, is a downward spiral. Macmillan can no longer afford to give away pens, which means people like you and me will find it much more difficult to emotionally engage with Beverly's message, which will result in fewer donations. The end result is that we might have to wait several months before we get another urgent appeal from Beverly – and when it does finally arrive it's unlikely to include a free gift.